Reviewers like to believe we have power of influence, but those in Stalinist Russia had power of life and death: a bad write-up spelled doom for the subject. Yet their opinions could not contradict those of the ‘great leader’, and he had a worrying tendency to change his mind. 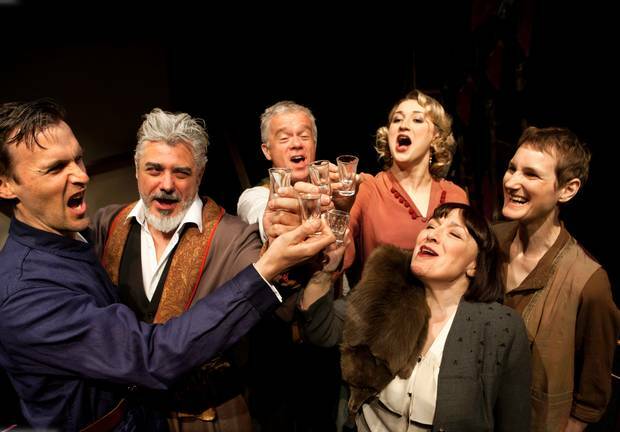 David Schneider’s riveting new play Making Stalin Laugh tells the tale of the Moscow State Yiddish Theatre, which, while battling for survival during the horrifying arbitrariness of Stalin’s purges, actually thrived creatively. It was lauded around the world, with Shostakovich calling Solomon Mikhoels’ Lear the best he’d ever seen. But with that high profile and lavish state support comes enormous risk, backstage squabbles competing with an ever-present threat of annihilation. This entry was posted in Journalism, Theatre and tagged anti-seminitism, david schneider, ham and high, hampstead, jew, jewish, jw3, kafka, king lear, london, making stalin laugh, moscow, Moscow State Yiddish Theatre, play, purges, review, russia, shakespeare, shostakovich, stalin, theatre, ussr, yiddish. Bookmark the permalink.